Traditionalists may blanch at the mere thought of a turntable that digitises the resolutely analogue content of the vinyl record it’s spinning. But that’s exactly what the new Cambridge Audio Alva turntable does. Why? Because the brand’s first turntable is also the first to offer Bluetooth aptX HD streaming, allowing the Alva to wirelessly stream its vinyl-based music wares to compatible ancillaries at 48 Hz/24-bit resolution. Compatible components include headphones, amplifiers and even Bluetooth speakers. The Bluetooth module also works with more conventional BT codecs, including standard aptX and SBC. Bluetooth means the turntable can be more conveniently positioned without having to be tethered to a playback system. However, it does provide analogue outputs for more conventional system configurations. The Alva therefore offers an intriguing mix of specialist hi-fi and lifestyle audio. It’s been designed to offer ease of use and versatility, but without losing sight of the need for sonic quality – something the British marque is renowned for. Surprisingly, Cambridge Audio has opted for a direct drive design as opposed to the more popular belt drive configuration, citing reliability and accurate rotation speed as the reason for the decision. To combat noise, interference and vibration, then Alva uses a hefty composite platter manufactured from polyoxymethylene, which is apparently known for its stiffness, dimensional stability and overall inertness. The one-piece alloy tonearm looks lilke it’s been sourced by Rega, and is fitted with a proprietary high-output moving coil cartridge, apparently designed in-house by Cambridge. The cartridge features an alloy body, exposed aluminium cantilever, and elliptical diamond stylus. To allow the Alva to stream its content via Bluetooth, the turntable steps up the phono signal using its own, integrated phono stage. That also means that the wired, stereo analogue outputs are line level devices, obviating the need for a separate phono stage. 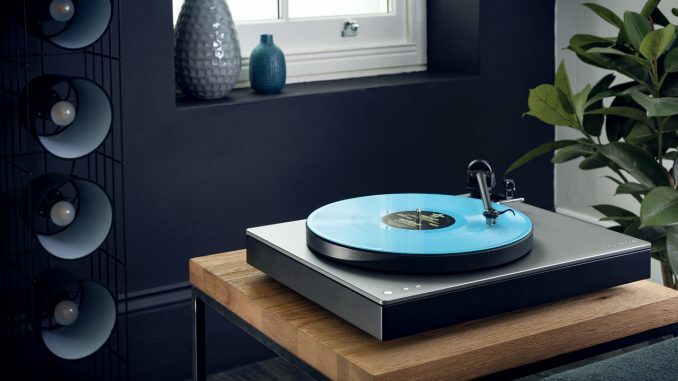 European sales of the Alva turntable are set to commence in early April, with a provisional retail price of around 1 500 pounds Sterling – that’s about R27 000 before shipping costs and transport duties.